Taking music on the move presents a particular problem when you're in busy places. On one hand there's the school of thought that noise cancelling is the way forward - removing the external noise, so it's just you and your music. On the other hand you have the Sony Xperia Ear Duo, a wireless headset designed for those who want or need to remain hyper-aware of their surroundings. There are, of course, a range of devices that will allow the outside in in varying amounts - like the Sony WF-1000X - and it's perhaps no coincidence that Sony is active in all these areas. This, however, carries the Xperia branding, because it's a "smart" product. The design of the Ear Duo is certainly interesting. To remove the problem of isolating the listener from the outside world, the Xperia Ear Duo doesn't stick a driver in your ear and seal it in. Instead, there's a circular tip that fits into your ear, while the body of the Ear Duo sits behind your ear. There's no escaping the fact that it looks a little like an old-style hearing aid, but at the same time, there's a futuristic vibe to the whole setup. It loops under your ear rather than over the top like some sports headphones do, but we found that it felt secure. The Ear Duo comes in two colours, this champagne gold colour or a more traditional black, and earpiece weighs about 10g. The case it comes in is important as that's also the charging case. You can either charge them from the case, or charge through the case, but importantly, it gives you somewhere to put your Xperia Ear Duo when you're not using them. You'll get about 4 hours of listening time, but the case will give you a couple of complete recharges. The aim of this hollow earpiece design is to allow the music they are producing to be seamlessly fused with external noise. That way you have a mixture, you're still entertained, but you can have people talking to you - you're hyper-aware of your surroundings. It's the sort of thing that urban runners or cycle commuters will benefit from - or anyone who has to cross busy roads and so on - because you remain completely aware of all sounds, while also being able to get notifications from your phone. They are IPX2 rated, so we're not sure how they will handle a typical British downpour. Slipping the Xperia Ear Duo on, it takes a little wiggle to get them in place, but then they seem to stay in place with pretty much no support. That's a little strange and it does take some time to get used to the sensation. Testing them on the Sony stand at Mobile World Congress, we listened to music while the Sony Agent was detailing how they work and running through the demonstration. That's a great case in point: we could listen at the same time, which is exactly why this device exists. After wearing them for a short time, we pretty much forget they were in place and were about to walk away still wearing them. Because there's a fusion of sounds, the music playing from the Bluetooth-connected Android phone became the background music for the room, like the soundtrack to your life. Exactly how secure they will be when it comes to running or cycling we can't year say. We found they stayed in place when we used some of the gestures they support: you can jerk your head left or right to skip tracks. It's a little odd, you might get some funny looks, but at least it's hands-free. The blocks behind your ears are where all the technology lies, as these handle the wireless connection as well as the housing the drivers that the pipe the audio around to your ears. We found the volume to be sufficient, but you can't really judge these as you might a pair of headphones. The right-hand earpiece is the master piece, connecting to your phone via Bluetooth and then controlling the pairing with the left-ear piece. They are compatible with both iPhone and Android devices, with a specific Sony app, as well as supporting native AI assistants, Google Assistant or Siri. They have been designed for Sony Xperia devices first, so the Sony Agent admitted that the Android experience would be better than that of iOS. We've mentioned that there is gesture support - like moving your head - but there's also touch controls from the surfaces of the Xperia Ear Duo. You can swipe the volume up and down easily, as well as tap to pause music. Compatibility with assistants means that not only will you be listening to music, but you can have incoming messages read to you, you can dictate replies and for Google Assistant you'll be able to do all the stuff that Assistant normally allows - like asking to have your lights turned on for example. There's no avoiding the fact that the Xperia Ear Duo are something of a niche product. These solve a particular problem and that's all about ensuring that you're fully connected to your online world, the outside world and listening to music. Yes, you can do this to a degree with some of Sony's other headphones that support ambient noise, but this is a whole degree clearer than using those devices. The design will divide some people for sure. On one hand there's a futuristic augmented audio experience going on, but on the other, it looks a bit like a hearing aid. 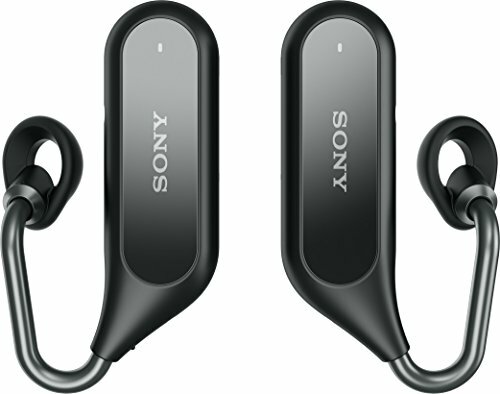 The Sony Xperia Ear Duo are now available for pre-order on Amazon.com and will be available in May for $280 in the US. UK pricing will be £229.